I thought this must be the case - that ruby is too perfect to find online without some great connections! I can't wait to see what you do with it. I think I might do this with it (it’s my yellow diamond and asscher open band). I have a ruby of similar hue and make a split band ring with both rubies facing each other. What do you think? Tekate, Sfadman and OoohShiny like this. Can you snap a pic of the 2 rubies together? Are they the same shape/cut? I would worry that one might out-shine the other is all. It’s hard to tell from this photo as I was unable to use natural light, but they are a similar colour. And shape. In the split ring I have, one is a yellow cushion and the other is a white asscher, and it works. I feel like the current ring you have works well because the two stones are purposefully mismatched. While both of your rubies are beautiful *cough send me one*, I think together one will always look "not as nice" as the other. 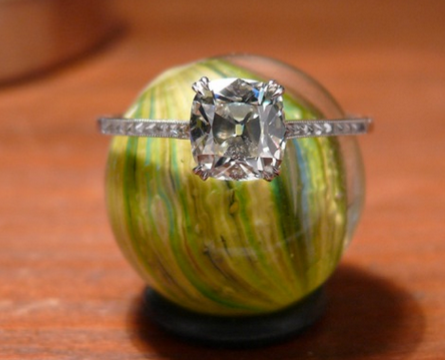 I think if you're going to do the double-stone setting again, I'd get a completely different stone to go with it. Yeah - you are probably correct. I have another emerald (see the photo of the under stone next to my other ring) but I fear it’s maybe too large to be set opposite the ruby? Mamabean, Matthews1127, gregchang35 and 1 other person like this. Or maybe this setting would be better? Mamabean, suzanne2, Matthews1127 and 4 others like this. The red and green reads a bit Christmassy anyway .I'm a fan of red and yellow...and red and white is always safe. Red and grey would be really nice too. Matthews1127, Sfadman and Tekate like this. My husband’s custom made Eternity Wedding band. Set in 18kt White Gold with a 2.5 T.W. Late to the game here, but that's a very handsome ring! Matthews1127 and Sfadman like this. It's been a hooooot minute since I've posted anything so what better to post than a family portrait of my current ring collection. Index Finger t2b: .79 Fancy Grey in antique rose gold, Chrysoberyl, .48ct J VVS1 Transitional in antique setting with sapphires. Mamabean, OoohShiny, suzanne2 and 6 others like this. Wow - you give me a run for my money! My favourite is the orange (love a shield-type cut) and the Burmese spinel. That colour is insane! Updated by basket settings on my princess studs to chevron settings. Platinum head with 18k WG posts with friction grip backs. Be bold and tell the truth. Jimmianne, Tekate, Dancing Fire and 5 others like this. I like the update! Kind of unique looking. here are pics of the before and after the setting change. The chevron/ V claw setting accentuate the corners of the princess more. and i think, it enhances the stone ie making them look bigger. The previous setting is typical of a basket with normal "button" prong setting. Tekate, Mamabean, OoohShiny and 2 others like this. Some are from this form but many are not. Hope this helps others with inspiration. If some mod thinks its a good idea to drop 140 images here on this board I can do it but I though it was better as an external link. Tekate and VDK1 like this. @kevnick80 your stones are really beautiful !!! JrJ, Sfadman, Tekate and 3 others like this. Did you have it custom-designed? Tekate and OoohShiny like this. Thanks for the compliment! You have super cool rings collection! Thank you. Check out my new rings!!! LisaRN, JrJ, Sfadman and 2 others like this. Hivona, SouthernGent, LisaRN and 6 others like this. Love it! Is that a fancy light yellow? I love how the shape looks almost like a cushion but is more rounded?